Stretch wrap is the most affordable way to wrap and secure products. Using the right thickness of stretch wrap to secure the product being wrapped will protect from product loss and reduce film cost. Below is a brief explanation of common stretch wrap terms referring to film thickness. Under that is a chart updated from our stretch wrap 101 page to include equivalent films, pre-stretched films, and blown film. Cast Stretch Wrap - A form of stretch film extrusion that involves melting resin pellets and extruding the film on cooled rollers prior to winding the rolls onto the core. Blown Stretch Wrap - A form of stretch film extrusion using air to form melted resin into a flat collapsing tube prior to winding the film onto the core. True Gauged Stretch Wrap - A stretch film thickness accurate with what a micrometer would show if used. A true gauged film is often a premium stretch film offering the highest amount of stretch. Equivalent stretch wrap – A different resin formula often making a stretch wrap tighter and stiffer. The lower stretch rate can often make an equivalent film have the retention power of a true 80 gauge film, but if measured by a micrometer the film would be thinner than 80 gauges. Equivalent is often great for use with boxes and products without sharp edges. Pre-stretch Stretch Wrap – A true gauged stretch wrap roll stretched out to 90 percent of maximum stretch-ability and placed onto a core. Typically used for lighter uniform loads. Less exertion is required to apply pre-stretched film. 37 Gauge A pre-stretched eighty gauge film. Great for bundling two light uniform objects together. Users can easily apply the film with minimal exertion A pre-stretched eighty gauge film. Great for wrapping light, uniform loads less than 800 lbs. Due to the film being pre-stretched, pre-stretched rollers on a machine are not necessary. Excellent cost saver when wrapping light loads less than 800 lbs. 47 Gauge Often referred to a hybrid or equivalent bundling film. A great option for bundling heavier uniform objects. No products with sharp edges or corners Often referred to a hybrid or equivalent hand film. The film is stiffer and does not require much stretch from users. Excellent for box and case wrapping up to 1800 lbs. Often referred to a hybrid or equivalent machine film. A stiffer machine film that works great with most machines. Great for lighter boxes and loads less than 1800 lbs. 60 Gauge Ideal for lighter smaller objects, small boxes, and banding light items together. Many moving companies use light gauge banding stretch film in place of tape. Ideal for loads up to approx. 1800 lbs. 12", 15", and 18" widths are ideal for shorter loads or loads where bottom and top only need to be wrapped. Same strength as 12”-20” hand Stretch wrap. Machines promote more efficient wrapping and reduce waste. The true gauged 60 gauge film offers excellent stretch during machine application. 63 Gauge Often measured in microns, a 63 ga film is 16 microns. Thicker and better puncture resistance than 47 ga. Film. Bundle and wrap heavier products with minimal sharp edges. Often measured in microns, a 63 ga film is 16 microns. Thicker and better puncture resistance than 47 ga. Wrap heavy loads of products up to 2200 lbs with minimal sharp edges. Often measured in microns, a 63 ga film is 16 microns. Thicker and better puncture resistance than 47 ga. Most popular machine film for standard boxed pallets ranging up to 2200 lbs. 70 Gauge Same uses as the 60 gauge, but enables slightly stronger hnewing strength. Often used to bundle multiple long cylindrical products. Ideal for loads up to approx. 2200-2400 lbs.12", 15", and 18" widths are ideal for shorter loads or loads where bottom and top only need to be wrapped. Same strength as 12”-20” hand Stretch wrap. Machines promote more efficient wrapping and reduce waste with premium stretch. 80 Gauge The most common gauge in all stretch wrap. Known to be very versatile and handle a variety of applications. Ideal for loads up to approx. 2200-2400 lbs. 80 gauge is the most common stretch film thickness and ideal for a variety of applications Same strength as 12”-20” hand Stretch wrap. Machines promote more efficient wrapping and reduce waste. 90 Gauge Better strength and stretch than a standard 80 gauge film. Used to wrap bundle firewood, angle iron, and a variety of other heavier objects Ideal for loads up to approx. 2400-2600 lbs. 90 gauge is a starting thickness for heavier film. The 18" and 20" 90 gauge and above is ideal for taller or heavier loads. Same strength as 12”-20” hand Stretch wrap. The ability to run with a higher tension with less tears. Excellent stretch rate and memory. 100 Gauge Commonly used for heavier boxes and products to bundle together. Medium heavy boxes and medium heavy items such as light lumber are ideal. Ideal for loads up to approx 2800-3000 lbs. The 18" and 20" 100 gauge requires maximum exertion during hand application to achieve the proper stretch rate. Same strength as 12”-20” hand Stretch wrap. The machine 100 gauge stretch film is often used to wrap pallets of 55 gallon drums, steel beams, and other heavy objects. 115 Gauge Used for smaller heavy objects, commonly used for banding sets of heavy products together. Ideal for loads up to approx. 3000-200 lbs. The 18" and 20" 115 gauge and above is ideal for taller or heavier loads Same strength as 12”-20” hand Stretch wrap. The 115 gauge provides excellent stretch with limited tears. 150 Gauge Greater strength and puncture resistance, great for regular and irregular shaped boxes. Ideal for securing steel, metal, and other heavy duty items. Not typically offered in a hand stretch film. The heaviest cast machine stretch film offered. 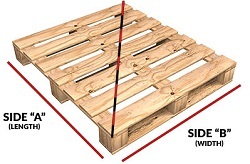 Meant for heavy duty pallet loads. With this guide, picking the right stretch wrap should be easy. If you have any questions about suggestions for a specific product application, feel free to contact us at 1-800-441-5090.